Paint me a picture: Paul Bolger: Get Good, Get Fast and Get Out! 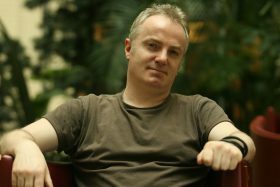 Paul Bolger has spent most of his career in the animation and film industry. He started out working on features such as the animated classics The Land Before Time and All Dogs Go To Heaven, and has since designed, written and directed a host of animated and live action projects, including contributing to the Sony/Aardman animated features Pirates – Band of Misfits and Arthur Christmas. Along the way, he has animated Kim Basinger and worked with the director of Who Framed Roger Rabbit, Richard Williams, on his troubled epic, The Thief and the Cobbler. He even had time to stop off and do some teaching in Dun Laoghaire School of Art and Design back in the nineties, where I had the pleasure of being one of his students for a while. 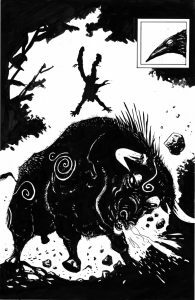 It was in 2015, however, that Paul made waves in Ireland as a writer and illustrator in print, with a Kickstarter project that produced Hound: Protector, the first of three comic books about the legendary Irish warrior, Cúchulainn. Paul, what was it that made you want to be a professional artist? Warren Comics from the US, Action and 2000AD from the UK and seeing Jim Fitzpatrick’s Thin Lizzy album covers and Irish mythology books inthe 1970’s as a kid. Also, not wanting to work outside in the Irish weather or fast food restaurants . . . that helped too. The animation studio, Sullivan Bluth, gave a lot of Irish artists their first start in professional work – what was the animation scene like then, and how have things changed? It did give me my start, along with Murakami/Wolf (who did the original Teenage Mutant Ninja Turtles cartoon show). I left college in the mid-80’s and was facing emigration or a less than favourable return to fast food production, as there weren’t many ways for an aspiring artist to make a living in Ireland unless you went into printing or graphic design, which I didn’t want to do. There wasn’t much hope of getting into comics when you lived in Waterford, so I sent in a portfolio to Sullivan Bluth and they hired me as an Inbetweener. So I put away the illustration dream for animation and 30+ years later I have come full circle with Hound. There were very few, if any, home-grown Irish studios at this time, so I ended up going to Berlin and then London with the idea of starting my own studio some day – which eventually came with Dagda Film, based in Dun Laoghaire in the 1990’s. Who are the artists who’ve most influenced your work on Hound? 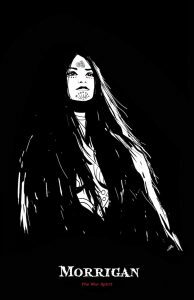 From “fine” art it would be Caravaggio and from comics and illustration it’s Hugo Pratt, Alberto Breccia, Dino Battaglia, Bernie Wrightson, Frank Frazetta, Harry Clarke, Mike Mignola, Frank Miller – although the list is endless. How does your animation process differ from your illustration one? I don’t animate much any more, actually. When I do work in animation it’s mostly as a director, designer, writer, producer and storyboard artist now. Animation and illustration are bedfellows at the concept and design stage. They part ways when they go into production in my opinion. I do like animating on paper (if I do it, which is very rare if at all these days) and I like illustrating digitally. So animation is like a 10K relay race where I depend on others to get it done but a comic is more like a sprint or 200m relay where you can do most of the running yourself or with a smaller team. What’s the weirdest thing that’s happened to you in your career? Which do you prefer, working with a team in an animation studio, or having the place to yourself, doing illustration work, and why? I like both. The control you get over your output from doing illustration is nice. You are in the driving seat and only have yourself to congratulate or blame when it goes right or wrong. If it is your own project, you can play god and if you are working for hire, all you might have to contend with is an editor and the few other creatives you might work with. Animation is like an aircraft carrier – slow to move, dependant on an army to run it and can often be overwhelming. What kinds of problems have you hit along the road to getting the Hound series off the ground, and how did you overcome them? If you weren’t drawing and writing, what would you be doing? What’s the most valuable experience you’ve gained on a job? It was more a piece of advice that has always stayed with me – “get good, get fast and get out!” As in learn, become valuable and move on. Move across town to another studio or another country, if those you work with can’t, or won’t, offer what it is that allows you to shine. 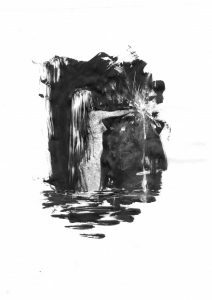 I am designing a feature film that will be released worldwide (we hope) in 2020, plus in the early stage of a new comic retelling The Children of Lir, and I am developing two new original animated feature films written by Barry Devlin. And I am back making music again – so busy, busy! Thanks very much to Paul Bolger for taking part in Paint Me a Picture. 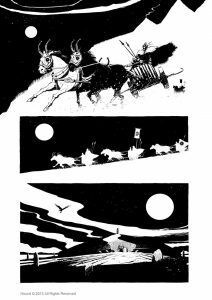 You can find out more about Paul’s ongoing comic and film project, The Hound, here: http://houndthemovie.com/.